This British brute wants everyone to notice it (and you). McLaren is churning out more versions of its supercars than we can keep up with, but that's a good thing since they're so incredible to drive. Now, the 600LT ('Longtail') emerges as a follow-up to the superfast coupe. With the same underpinnings as the Coupe, it only gains 110 pounds while keeping the same rigidity via the Monocell II carbon monocoque cage. The fact that it has a retractable hardtop is icing on the cake. From track to street to boulevard, the 600LT Spider is ready for anything. In racing parlance, the Longtail moniker is directly from the racing version of the legendary F1 from 1992, called the F1 GTR "Longtail". The longer back end added downforce and stability, as well as aerodynamics to the already potent F1 package. It won th3 24 Hours of Le Mans in the GT class in its first outing, a Herculean feat. 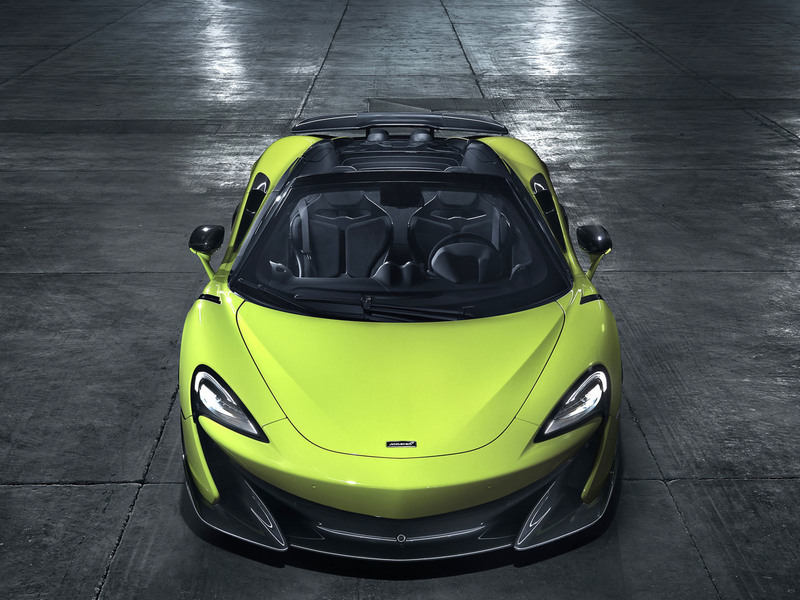 This 600LT is the newest addition to the Longtail line, and it promises to thrill. The car might be a convertible, but it's ready to take on the track thanks to stability, power, and handling. The added weight doesn't hamper its performance since no chassis rigidity was needed because of the strength of the Monocell II. The car is only 0.2 seconds slower than the Coupe (2.8 versus 2.6), still blindingly fast. It'll do 196 with the top down! (201 with the roof up). Essentially, the Spider is about as fast as anything out there, fixed roof cars included. The twin cowls behind the seats extend to the Longtail, and the result is a perfect view of the fat twin round exhaust pipes (similar to the Porsche 918 Hybrid's) that protrude from the rear top of the car. Under hard acceleration, you can see fire shoot out, making the price of entry worth it on that fact alone. Turn your head quickly, and you'll see the flames shoot out of the top-mounted exhaust ports. The cabin has the same everything as its fixed roof brother with big racing buckets, a driver-focused steering wheel, and huge swaths of dark Alcantar everywhere for aesthetics and grippiness. The seats can be upgraded to the ones from the McLaren Senna, and HVAC can also be removed in order to reduce weight for optimal track performance. The rear engine compartment houses the same monster 3.8-liter twin-turbo V8 that's good for 592 horsepower and 457 lb-ft of earth-ripping torque. The big carbon fiber spoiler in the back and ample aero bits everywhere provide the necessary downforce for great track times, and the huge carbon ceramic brakes should scrub speed remarkably well. The transmission is a rapid-fire dual-clutch seven-speed automatic with paddle shifters. There's even something called an "Ignition Cut" that operates in Sport mode to enable faster shifts and cue a resolute crackle from the pipes. There's also an "Inertia Push" that amps up acceleration when you select Track Mode. Say goodbye to your face's ability to retain its shape as you thrash this beast. The sporty-luxe cabin is the same as the coupe. No need for any changes here. The asking price, as you guessed, isn't cheap (no McLaren is, for that matter). $256,500 can get you into the seat of one of these but probably won't come close to covering the fuel costs or speeding ticket fees you'll incur.